Most people, when I ask them to describe a time they experienced God, share a moment in nature. Can you think of a time when you experienced a spiritual sense of peace and union with God in creation? It could be something as simple as digging in the dirt in your own garden or watching a hummingbird or cardinal from your kitchen window. Some of us may have experienced that sense of inner peace and the awesomeness of God when we first visited the Grand Canyon or one of the National Parks in Utah. Perhaps we felt it walking through a mountain forest with hush of an evergreen breeze and the soft pillow of pine needles beneath our feet. Some of us may have experienced God’s peace watching the ebb and flow of the wavs on the beach, the view of the lake from a cabin up north, or the wind bending fully grown crops on the farm of our childhood. Our family has had many such moments in the high red rock desert of northern New Mexico at a camp called Ghost Ranch. Whenever we went hiking, our children got along without a complaint and seemed to sense the peace of being together in God’s creation. These experiences teach us of the eternal truth mystics have been saying for centuries: all of life is one. All of life in us, around us, and in the cosmos is connected. Our passage from Job affirms God’s presence in all of creation: “Where were you when I laid the foundation of the earth?” (Job 38:4). The Gospel of John begins: “In the beginning was the Word, and the Word was with God, and the Word was God. He was in the beginning with God. All things came into being through him, and without him not one thing came into being.” All life is one in Christ. Later, in John 17, Jesus prayed for his followers, “that they may all be one. As you, Father, are in me and I am in you, may they also be in us, so that the world may believe that you have sent me.” St. Paul’s words in Acts were part of our Confession today, “In God we live and move and have our Being” (Acts 17:28). Rumi, a 13th century Muslim poet said, “We are one. Everything in the universe is within you.” St. Catherine of Siena in the 14th century taught that “The soul is in God and God in the soul, just as the fish is in the sea and the sea in the fish.” God is in all of creation; all life is one. We confess that God is the source of all life every time we proclaim the Apostle’s Creed in worship: "I believe in God, the Father, creator of heaven and earth." God has created all of life and as we have learned through the study of evolution, God continues to create life in us, through us, around us and beyond us in the cosmos. While studying for my Certificate in Spiritual Direction, I learned a new word for the spiritual truth that all of life is one and that God’s creative work continues: cosmogenesis. Cosmogenesis describes that the evolution of the universe is on-going, with God as the dynamic power and force of love that allows continuing creation and change to occur. Since God creates through an evolutionary universe, God is present to all the cosmos and all creation from within; that is, all of life is One. But then a great storm arose. The Greek word for “great” is, “megas”—a mega-storm, a huge storm arose that started filling the boat with water. It must have been a biggie, because even the fishermen were scared. Water poured into the boat and looked like they could sink to the bottom. Terrified and scared that they were about to die, the disciples woke up Jesus, who slept soundly, as if the storm were a lullaby. Let’s get this straight—the disciples have seen Jesus heal more people than they can count, cast out demons, make paralytics walk, and withered hands and limbs as good as new. Yet, none of these experiences with Jesus up to that point, kept them calm in the face of a mega-storm. The disciples were just as scared as if they had never witnessed Jesus performing healing, after miracle, after exorcisms, after more healings. Jesus had done all that, and now they think he was just going to let them die. It should have been obvious to the disciples by this point, that Jesus had power over just about everything; if he can tame a demon, then why not a storm? But the disciples do not yet believe, they do not trust Jesus. The storm didn’t bother Jesus because, well, cosmogenesis! All of life is One! Jesus is the Word in the beginning, everything was created through him, and he is in God and God is in him, and God is present in all of Creation from within. Jesus was already One with the storm and knew it wasn’t a threat. Mark tells us Jesus calmed the storm and then he rebuked the disciples for their lack of faith. But what if it’s the other way around? What if Jesus wasn’t rebuking the storm at all—what if he was really rebuking the disciples for their fear and distrust and panic, shouting, “peace, be still!” and the wind and the waves overheard him? What if the real miracle of the story is not that Jesus has power over the wind and the waves and the rain—that goes without saying—what if the real miracle that Jesus wanted was faith and trust from his followers? What if the real miracle of the story is getting the human being to trust God’s power in Jesus Christ? Jesus knows he has power over the elements, but what about that part of creation with a developed brain, with human consciousness, and free will to choose God or not? 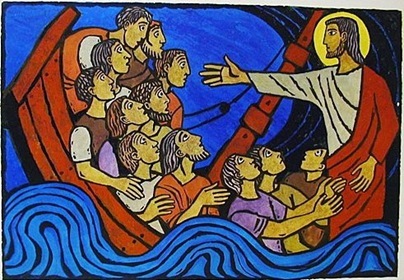 What if the miracle Jesus was looking for in the boat, was for his human followers with consciousness and free will, to have faith and offer obedience to him the way demons and diseases, the wind and the waves do? The real question in the boat is not whether the storm in creation will obey Jesus, but whether or not the storm inside the human beings in creation will be calmed so they can trust and follow Jesus, even when they were scared. What about us? This story reveals that we don’t need Jesus to calm the storms of our lives. We need Jesus to calm us. “Peace, be still! Be still! And know that I am God!” In the midst of fear or disappointment, loneliness, illness, or the troubles of this life, the miracle Jesus is looking for is in us—in our complete, no-holds barred, throw-your-heart-over-the-bar trust that Jesus is with us, and no matter what, and that in death and in life, we belong to Christ! The miracle Jesus is looking for is our conscious, free-will choice to trust and obey him come what may. That peace we experience in nature—the awesomeness of God—the feeling that all of life is One—that peace can be ours every day. It’s not a peace reserved for summer vacation or 30 seconds looking out your kitchen window. It’s a peace Jesus gives us every day of our lives, every moment of our lives, even in amid the storms of life. Jesus is the mega-peace we cling to and trust in our daily life, and in our life as the church. We don’t know what the future will hold nor how we’re going to get there. But we do know that Jesus is in the boat with us, and that He is one with God, and we are One with him. We know that God made every person in our community and in the world, and he calls for fearless followers who will hike up their scaredy-pants and follow him across the lake, through the storm, and over to the other side for mission, for love, for inclusion, for healing and for hope.